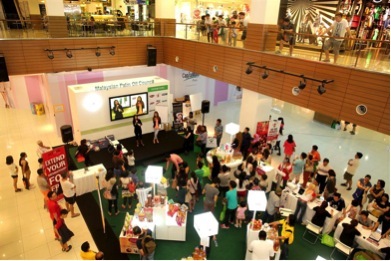 The 2014 Palm Oil Health & Nutrition Road Show was organised by MPOC at the Gurney Plaza shopping centre, Penang from 21-22 June 2014. The roadshow comprised an exhibition area, activity sessions with invited Malaysian celebrities, a fitness demo and complimentary health checks. This was visited by an estimated 1,000 shoppers throughout the two days. A total of 7 exhibitors participated at the Roadshow to display their products that are palm oil based. These included cooking oils, various food products and heath care products (vitamin E supplements). The MPOC information kiosk offered educational and related materials about Malaysian palm oil and this allowed visitors to learn more about the health benefits, as well as the versatility of palm oil in our daily lives. The highlight of the roadshow was the activity sessions with our Malaysian celebrities, Jojo Struys and Megan Tan who conducted exciting games for families, allowing participants to win several prizes. Both celebrities were also adept in utilising their understanding on palm oil's health and nutrition properties in imparting information to the contestants and audience present. MPOC also received close to 750 survey forms that also served as an entry form for the 'Guess the FFB Weight' contest. Of the number of entries received, 8 contestants managed to guess the correct weight of the FFB bunch and received a hamper of palm-based products worth RM200 each. From the response to this survey (which was meant to gauge the level of awareness on the benefits of palm oil), it was found that while most consumers know that palm oil is cholesterol free, many are still not fully aware of the other health benefits of palm oil. (eg rich in anti-oxidants, balanced fatty acids etc). Therefore, MPOC is likely to organise more roadshows later this year to further increase awareness amongst Malaysian consumers, especially on the health and nutritional benefits of Malaysian palm oil.